Welcome to WA Hockey′s home on the web! Welcome to the Westford Academy Hockey website. Here, you'll be able to get news, information, schedules, game results, directions and more. Check back often for the latest information about our hockey program. GO GREY GHOSTS!!! This is a FREE web site for accurate directions to all hockey rinks across the US. Click here for the Boys' varsity Merrimack Valley/Dual County League Standings. Click here for the Girls' varsity Merrimack Valley/Dual County League Standings. With the warm weather today, it's a good time to start thinking about our 11th Annual Westford Academy Hockey Alumni Golf Tournament. 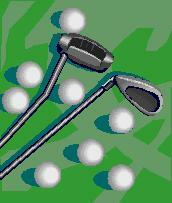 This year's date is Friday, June 21st, with a shotgun start at 9:00 AM, and will again be held at Butter Brook Golf Club in Westford. Click here for a flyer/registration form. This tournament has been selling out, so we suggest you register early. 10 Years! 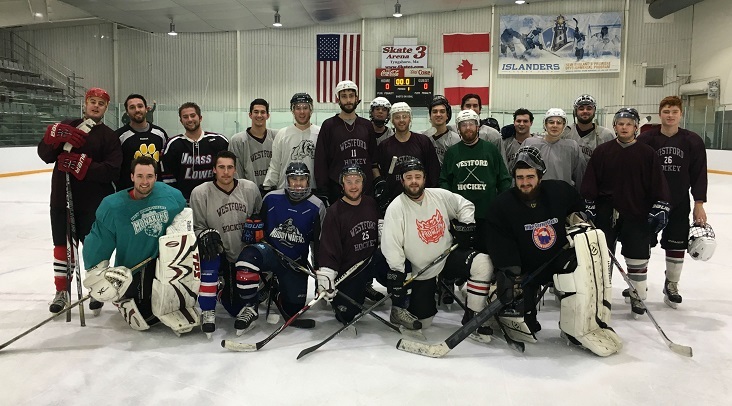 It's hard to believe that this all started 10 years ago when Bill Richards put a motley crew together to organize a golf tournament so that the WA hockey brothers could get back together, while also supporting the current WA Boys' hockey program. Thank you, Bill. We miss you! Thank you to the 136 golfers that came out and made our 10th Annual Westford Academy Hockey Alumni Golf Tournament another huge success. The weather was perfect...78 degrees and sunny. It was an awesome day with WA hockey alumus from almost every year, from WA hockey's first year 1982, playing. It was the most competitive field yet, with FIVE teams coming in tied, shooting a 12 under score of 60. 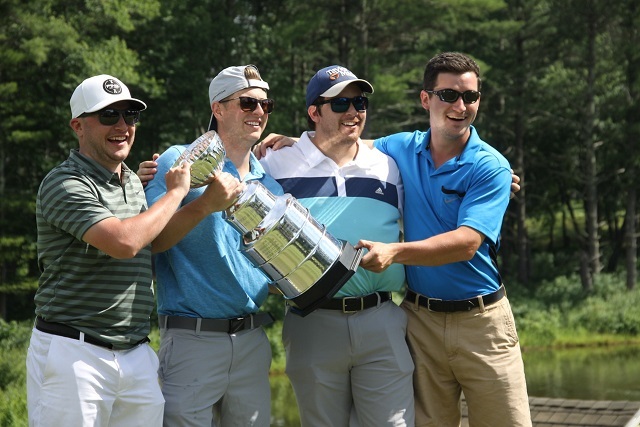 The winning team of Dana Sanderson, Tyler Harrington, Brian Milisci, jr, and Kris Kavanaugh won on the FIFTH tie breaker, to win the new, Stanley Cup replica trophy. Pictures will be posted in the next week or so, so check back soon. Save Friday, June 21, 2019 on your calendar for our 11th Annual WA Hockey Alumni Golf Tournament! Click here for an awesome article by Jamie McKinven. It takes about 15 minutes, but is well worth the read!